As of today, I have 59 60 (The QI Book of the Dead was the Daily Deal) books in the "Purchased to Read" folder of my Kindle. Thanks to Amazon's dastardly policy of price matching, this number is rapidly shooting higher due to Sainsburys doing an ebooks for 99p yoke throughout October. The problem continues due to my having a rather decent local library which insists on supplying me with a variety of interesting books every time I visit. Plus I've got a hardback copy of Bring Up The Bodies giving me an accusatory glare but it's been doing that since the September before last so I've got good defences worked out. In the interests of trying to not feel as though I've wasted whole pennies on stuff, I'm making the attempt to get through some of the stuff riiiiiight at the back of the folder which I barely remember buying and am not entirely sure why I did. Heartland I do remember buying, and why. Reason the first: it's set in Dudley and while I'm Welsh, I'm also half Birmingham. Dudley is not Birmingham, but they're close enough. Plus I know an Enoch and Eli joke about Dudley. Reason the second: it's from Tindal Street Press. I pay attention to the publisher when I buy a book, especially the small independents (which TSP probably still was when I bought this), and I've read some good ones from them. Deborah Morgan's Disappearing Home and Catherine O'Flynn's What Was Lost (srsly, ignore the cover) to name two. However, it's not a book for me, and I should emphasise that one and a half star is a purely personal opinion. If you're not me, you may well like this a lot. It's slow, and I'm not sure if it's slow because it's setting everything up (a la Case Histories by Kate Atkinson), or whether it's slow because it's one of these books which wanders through the narratives of the various characters with no particular impetus to get anywhere. 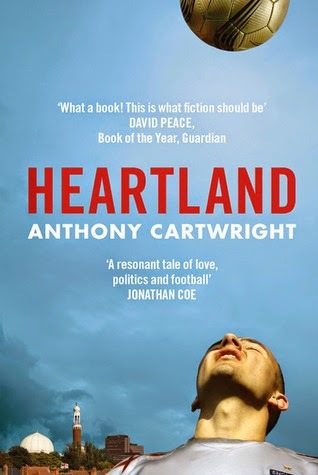 I do like those kinds of books, but my enjoyment is dependent on having good writing and compelling characters, and Heartland only manages the first of those. I freely admit I am rubbish at keeping characters straight. If Game Of Thrones the TV series didn't have such fantastic art direction, I would have given up after an episode or two. Heartland, for me, just doesn't give enough distinction to the characters for me to be able to tell them apart. This is made more difficult because the narrative covers the same characters at different points in their life - you have Rob watching England vs Argentina in the pub, Rob playing a game of football as part of a local team, Rob being a teaching assistant - all only divided by paragraph breaks. It says a lot for the writing that those transitions were never confusing, it was my inability to tell the difference between Rob and Jim, let alone remember who Jim was, which drove me to give up. Then there is the football. I remember England's match with Argentina, but I'm not wild about reading a play-by-play breakdown of it interspersed with conversation. Or about any of the other football matches featured. Write me a book about rugby and we'll talk. If I didn't have so much else to read, I probably would have stuck with it a bit longer. I got to page 100, and the first 40 or so of those were a real struggle. It did begin to pique my interest a bit but ultimately not quite enough, so I'm going to give it one and a half stars. Labels: Abandoned, Anthony Cartwright, Heartland, I blame Jim, One and a Half Stars, Read 2013, review, So. Much. Football, Why did I buy this one again?